Comic Victoria Wood has said she and actress Julie Walters will share the role of cleaning lady Mrs Overall in her stage musical of Acorn Antiques. 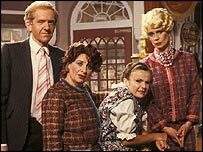 The original stars - Walters, Celia Imrie and Duncan Preston - will recreate their roles from the spoof soap opera first seen on TV in 1985. The show, written by Wood and directed by Trevor Nunn, will open in February. The TV version, from her Bafta-award winning show, sent up the wobbly sets and wooden acting of some soap operas. Wood originally played Miss Berta in the show, which featured the goings-on in an antiques shop. Imrie starred as Miss Babs and Preston as Mr Clifford while Walters endeared herself to millions with her wrinkly tights and coconut macaroons as the loveable cleaner Mrs Overall. Speaking at the Theatre Royal Haymarket, in London, Wood said she first mooted the idea for a musical back in 2001. "I wanted to write a musical and it was just like a brainwave," she said. "I thought 'why not make it about Acorn Antiques?' It is something that people may recognise." Jokingly described by Wood as a "modern morality tale", the musical is set in a small theatre in Sutton Coldfield where the director - played by Neil Morrissey - is hoping to rehearse his new work. He calls the play Acorn Antiques and lures some of the original cast of the axed TV soap to play their own parts. But when things do not pan out planned, Mrs Overall eventually gets the chance to realise her dream to have a "proper" musical in the West End with "lots of lovely singing and dancing". Wood said it was a "bonus" that the original cast members had all agreed to take part in the production, along with Sally Ann Triplett in the role as Miss Berta. She said: "I didn't write it with the purpose of having the [original cast members] in it, so it's a huge bonus that they are in it." Wood will play the part of Mrs Overall on Monday nights and Wednesday matinee when Walters "goes to bingo". She said: "It's [Julie's] performance, which I shall be copying - although I may get myself a different pinny. "It was never my intention to be in it, but it seemed a good way of pleasing the audience and keeping the excitement. "Eight shows a week of singing and dancing is a big undertaking for one person." Walters said the hardest thing about the role was learning how to tap-dance. "I nearly kicked myself to death," she said. "Apart from that I just thought what a great pleasure it is going to be. "It's a fun job and it will be great getting together with everyone again." Walters admitted she was getting increasingly like Mrs Overall as she got older. "I'm getting the physique, the posture and just looking older. I'm also forgetting the lines more," she said. Wood said Walters had been signed up to play Mrs Overall for the first 16-weeks of the run. "After that it will be like the hunt for Scarlett O'Hara to replace her," she added. Tickets for the musical go on sale at the Theatre Royal, Haymarket on 3 December. Acorn Antiques - The Musical opens on 9 February 2005.